When we were asked by the NFL and Bruno to play our song "Give It Away" at the Super Bowl, it was made clear to us that the vocals would be live, but the bass, drums, and guitar would be pre-recorded. I understand the NFL's stance on this, given they only have a few minutes to set up the stage, there a zillion things that could go wrong and ruin the sound for the folks watching in the stadium and the t.v. viewers. There was not any room for argument on this, the NFL does not want to risk their show being botched by bad sound, period. 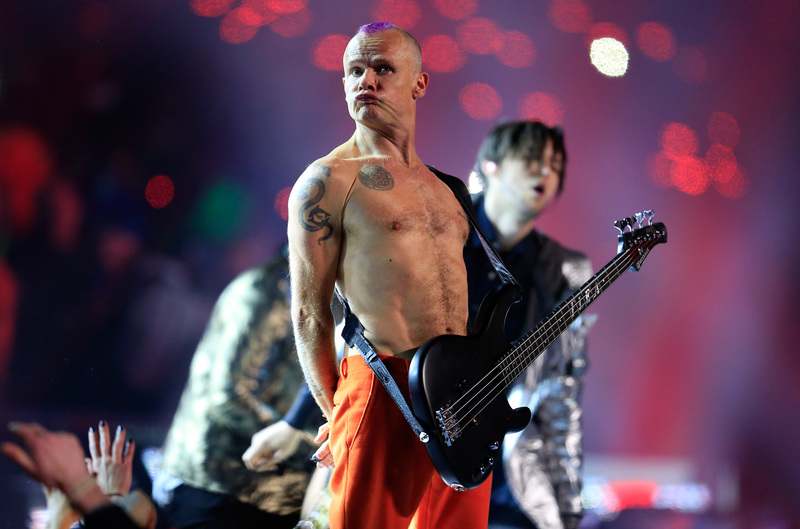 The Red Hot Chili Peppers stance on any sort of miming has been that we will absolutely not do it. The last time we did it (or tried to) was in the late 80's, we were thrown off of 'The Top Of the Pops' television program in the U.K. during rehearsals because we refused to mime properly, I played bass with my shoe, John played guitar atop Anthony's shoulders, and we basically had a wrestling match onstage, making a mockery of the idea that it was a real live performance. We mimed on one or two weird MTV shows before that and it always was a drag. We take our music playing seriously, it is a sacred thing for us, and anyone who has ever seen us in concert (like the night before the Super Bowl at the Barclays Center), knows that we play from our heart, we improvise spontaneously, take musical risks, and sweat blood at every show. We have been on the road for 31 years doing it. So, when this Super Bowl gig concept came up, there was a lot of confusion amongst us as whether or not we should do it, but we eventually decided, it was a surreal-like, once in a life time crazy thing to do and we would just have fun and do it. We had given this a lot of thought before agreeing to do it, and besides many a long conversation amongst ourselves, I spoke with many musician friends for whom I have the utmost respect, and they all said they would do it if asked, that it was a wild trippy thing to do, what the hell. Plus, we the RHCP all love football too and that played a big part in our decision. We decided that, with Anthony singing live, that we could still bring the spirit and freedom of what we do into the performance, and of course we played every note in the recording specially for the gig. I met and spoke with Bruno, who was a beautiful dude, a real talented musician, and we worked out something that seemed like it would be fun. We recorded a track for the day, just banged one out from our hearts that was very like in spirit to the versions we have been playing live the last few years with our beloved Josh on guitar. For the actual performance, Josh, Chad, and I were playing along with the pre recorded track so there was no need to plug in our guitars, so we did not. Could we have plugged them in and avoided bumming people out who have expressed disappointment that the instrumental track was pre recorded? Of course easily we could have and this would be a non-issue. We thought it better to not pretend. It seemed like the realest thing to do in the circumstance. It was like making a music video in front of a gazillion people, except with live vocals, and only one chance to rock it. Our only thought was to bring the spirit of who we are to the people. I am grateful to the NFL for having us. And I am grateful to Bruno, who is a super talented young man for inviting us to be a part of his gig. I would do it all the same way again. We, as a band, aspire to grow as musicians and songwriters, and to continue to play our guts out live onstage for anyone who wants to get their brains blown out. Certainly the logistical nightmare that is the halftime show requires a bit of re-engineering of performance tactics. And while we're far from a fan of the practice, in a high-stakes situation such as the most-watched television event, ever, when the main focus is a football game that has, really, absolutely nothing to do with the performances that take place in the middle, it's not that surprising a choice, either. Whatever the case, at least their lead singer, Anthony Kiedis, performed live, right? We've got to start picking our outrage battles a bit more carefully, Internet.